(02/04/1814) On April 2,1814, the preserving Senate under the impulse of Talleyrand (chief of the provisional government since the day before) and of its president Barthélémy votes the forfeiture of the Emperor. According to many biographers', Cambaceres is joined the act of forfeiture twice voted by the Senate: first once 07/04/1814 and one second time 09/04/1814. In the facts, it is the cardinal Etienne-Hubert de Cambaceres who on April 7 gives his support for the act of forfeiture of the Emperor. 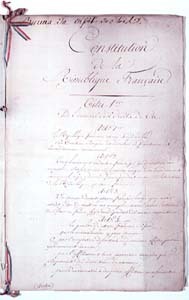 On April 10, Jean-Jacques Régis addresses to Talleyrand his full adhesion “with all the acts made by the Senate since April 1 as to the provisions which are following its acts.” Many senators await the response of Cambaceres to decide, the letter was thus antedated at the April 9 and immediately inserted in the edition of the Moniteur of the 12/04/1814. Art 32 : Great dignities of the Empire are those of Great Elector, Archchancellor of the Empire, Archchancellor of State, Archtreasurer, Constable, High Admiral. Art 33 : The holders of great dignities of the Empire are named by the Emperor. They enjoy the same honors that the French princes, and immediately take row after them. The time of their reception determines the row which they occupy respectively. Art 34 : Great dignities of the Empire are irremovable. Art 35 : The holders of great dignities of the Empire are senators and advisers of State. Art 36 : They train the large council of the Emperor. They are members of the private council. They make the large council of the Legion of honor. Art 40 : The archichancelier of the Empire makes the functions of chancellor for the promulgation of the senatus consult organics and the laws. He also does those of chancellor of the imperial palate. He is present at the annual work in which the large judge Minister for Justice returns account to the Emperor of the abuses which can have been introduced into the administration of justice, either civil, or criminal. He chairs the imperial high court. He chairs the joined together sections of the Council of State and Tribunat, in accordance with article 95, title XI. He is present at the celebration of the marriages and the birth of the princes, the crowning and funerals of the Emperor. He signs the report which the Secretary of State draws up. He introduces the holders of great dignities of the Empire, the ministers and the Secretary of State, the large civil officers of the crown, the first president of the Supreme court of appeal, with the oath which they lend between the hands of the Emperor. They receives the oath of the members and the parquet floor of the supreme court of appeal, of the presidents and Attorney Generals of the Courts of Appeal and the courses criminal. It introduces the solemn delegations and the members of the courses of justice admitted at the audience of the Emperor. It signs and seals the commissions and patents of the members of the courses of justice and members of the legal profession; it seals the commissions and patents of the administrative civil functions, and the other acts which will be indicated in the bearing payment organization of the seal. Art 46 : Each holder of great dignities of the Empire receives annually, as fixed salary, one the third of the sum affected to the princes, in accordance with the decree of the December 21,1790. (18/05/1804) Convinced republican, Cambaceres disapproves the principle of a hereditary monarchy. This evening of March 1804, it entrusts its feelings to Lebrun : “Bonaparte who will not be retained any more by the shapes of the republic will take for Louis XIV, and France made a Revolution against that. (...) We made the war in Europe (...) and will make we now to give it to him monarchs wire or brothers of ours, and France will succumb to these insane companies. And then, Lebrun, you know well who if a throne is restored, the partisans of the Bourbons will find the way easier to carry their applicant there. Which serious error!”. The legislative commission charged to write the new constitution sets up itself: y sit the consuls, the ministers and some senators like Tronchet and Roederer. Very quickly, Cambaceres which argues against the monarchical principle, runs up against Bonaparte. This one, flattered by Talleyrand and Fouché, puts Cambaceres at the variation of the discussions; the tension shows between the two men. On May 15, Cambaceres argues against heredity: “That there is not this stupid institution, anachronistic and destroying, which entrusts the capacity to that which by chance was born the first” then it resigns of its functions of Second Consul. The following day, Bonaparte convenes Cambaceres with Saint-Cloud to try to make it change opinion. He proposes the station of Archchancellor to him (station created on the councils of Talleyrand which coveted it). Cambaceres accepts and to cross short to the rumours of dissensions between the two men, it is Cambaceres, president of the Senate which proclaims the on May 18 Empire in Saint-Cloud. (21/10/1794) Demonstration organized on the Field of Mars to celebrate the complete release of the territory of the Republic. Cambaceres, president of Convention, pronounces speech, where he recalls the day “where a hypocritical conspirator spread out the sumptuous apparatus of tyranny, and to burn, in the honor of the Divinity, an incense that in secrecy he held for him”. A few months were passed, “and here that the people and his representatives, gathered in this same enclosure, come to proclaim there the freedom and the defeat of the despots united against it”. It speaks about the time when the French, within abundance and of happiness, would say to their children: “O have you the glances were never soiled by the aspect of a throne, learn that it was times when your fathers curved the head under the rod of a tyrant; learn the combat by which they could conquer the Republic”. And it exhorts the future generation “to preserve carefully the invaluable heritage of freedom”, and “to think that always one would seek to charm this crowned deposit to him”. Levies of conscripts The resumption of the war in 1805 obliges the fast lifting of an army. The legislative Body not being in session, the conscription cannot follow the legal way, the Emperor thus requires a vote of the Senate which by a senatus consult authorizes the lifting of 80.000 men. The relative docility of the Senate skilfully operation by Cambaceres leads Napoleon to use the senatorial procedure with each one of its needs for troops. In fifteen years of being able, Napoleon raises approximately 2 million men (either 36% of mobilizable or 7% of the French population). The big rise of the liftings in the last years of the reign gives birth to the legend from the ogre and makes the mode unpopular. The Senate tries to make resistance in 1814 but discredited by years of docility, he loses any popular base. Cambaceres appears in first line : for the public opinion he is responsible for the multiple liftings of conscripts. True black spot of its political career: the conscription is the cause of the unpopularity of Cambaceres. Under the Consulate, Cambaceres will be opposed without success to the arrests of the Moreau general and the duke of Enghien. (See also hereditary Empire). Under the Empire, he will disapprove the divorce with Josephine, explaining what the French people like her very munch. Whereas he works with the Russian ambassador Kourakine to overcome the last reserves of the tsar Alexandre Ist, Cambaceres fights the Austrian marriage while arguing that contrary to Romanov, Habsbourg never respected alliances by marriage. Its principal success is the safeguard of the parliamentary system, which prevented the return of the absolute monarchy at the Restoration. In October 1809, Napoleon decided to remove the legislative Assembly and to vote the laws himself. Cambaceres, very attached to the ideas of the Revolution, never will not work this dossier. In 1812, Napoleon, exceeded by slownesses of Cambaceres, threatens to modify the Constitution in order to be able to go beyond the Archchancellor's blocking. Cambaceres still succeeds in saving time until December 1813. Cambaceres ceases his political offices at the beginning of the year 1814 after the adjournment of the legislative Assembly. The caricature opposite date of 1814. It illustrates the combat of four years between Napoleon and Cambaceres for the decree of adjournment of the legislative Assembly. It takes as a starting point The Fighters : an ancient statue preserved at the Museum of the Offices in Florence. Private Police Like Fouche or Talleyrand, Cambaceres has his own network of advisors. He names chief of his secret police certain Guilly, former attache with the police force of safety of the Directory. Guilly is described like “large brown, a little arched and deprived of an eye in consequence of a combat of gun” (Prefecture of Police, report of the 08/06/1802). One evening in a Parisian coffee, one named Vivier says that it is the agent of the second Consul and that it awaits a mission in province (Prefecture of Police, report of the 12/08/1801). One knows few things on the private police force. If it is of public notoriety that the agents of Cambaceres are well paid, there is not any trace in the books of reason and the registers of expenditure. In 1802, Bonaparte requests from the Dossonville police chief a detailed report on the activities of the secret police of Cambaceres. Hardly written, this document disappears from the files of the Prefecture of Police. Art 24 : The citizens Sieyes and Roger-Ducos, outgoing consuls, are named members of the Senate: they will meet with the second and the third consul named by the present Constitution. These four citizens name the majority of the Senate, which is supplemented then itself, and proceeds to the elections which are entrusted to him. Art 39 : The government is entrusted to three consuls named for ten years and indefinitely re-eligible. Each one of them is elected individually, with quality distinct from first, or second, or third consul. The Constitution names First consul the citizen Bonaparte, ex-consul provisional; second consul, the citizen Cambaceres, ex-minister of justice; and third consul the citizen Lebrun, ex-member of the commission of the Council of Ancients. For this time the third consul is named only for five years. Art 40 : The First consul has particular functions and particular attributions, in which it is temporarily compensated, when it is necessary, by one as of the his colleagues. 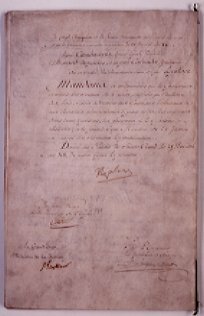 Art 41 : The First consul promulgates the laws; he names and revokes at will the members of the Council of State, the ministers, the ambassadors and other agents external in chief, the officers of the sea and Army, the members of the local governments and the commissions of the government close the courts. He names all the criminal judges and civil others that the Justice of the Peace and the judges of cassation, without being able to revoke them. Art 42 : In the other acts of the government, the second and the third consul serve in an advisory capacity: it sign the register of these acts to note their presence; and if they want it, they consign their opinions to it; after which the decision of the First consul is enough. Art 43 : First the consul salary will be of five hundred thousand francs in year VIII. The treatment of each of the two other consuls is equal to the three tenth of that of the first. “Deep Moralist, apostle of freedom, Rousseau were the precursor who called the nation in the roads of glory and happiness… To the first glance that it threw on mankind, it saw the people with knees, curved under the sceptres and the crowns; it dared to pronounce the words of equality and freedom! These words resounded in all the hearts, and the people rose. (…) It has the first predicted the fall of the empires and monarchies: it said that Europe had aged, and that these large bodies, close running up, were going to collapse as these ancient mounts which subside under the weight of the centuries. (…) Rousseau lived in poverty, and its example teaches us that it rests with fortune neither to give nor to charm the true size. 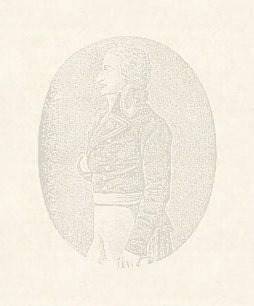 (…) His life will be one time in the record of the virtue; and this day, these honors, this apotheosis, this contest of a whole people, this triumphal pump, any advertisement which national Convention wants to discharge at the same time, towards the philosopher of nature, and the debt of the French, and the recognition of humanity”.